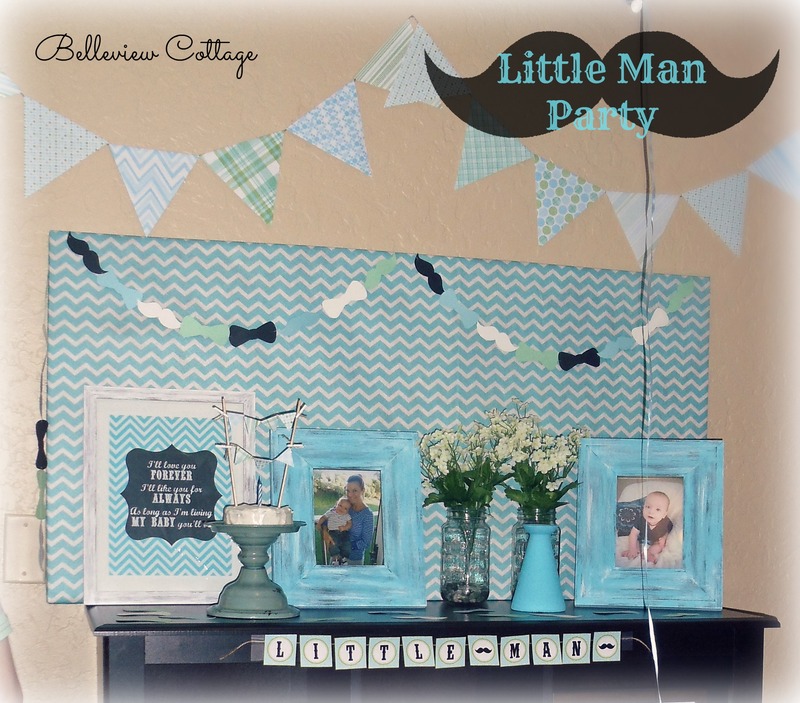 *Budget Tip*: Many of the accessories used for this party were purchased from Hobby Lobby. Each week, a large portion of the Hobby Lobby store is on sale for 50% off. To maximize your savings, make a list of needed items well in advance of your party. Then, check the Hobby Lobby sales flier online each week. Buy what’s on sale for that week, and hold off on the other items. Chances are the other items will be 50% at some point in the near future, so keep checking the sales flier. 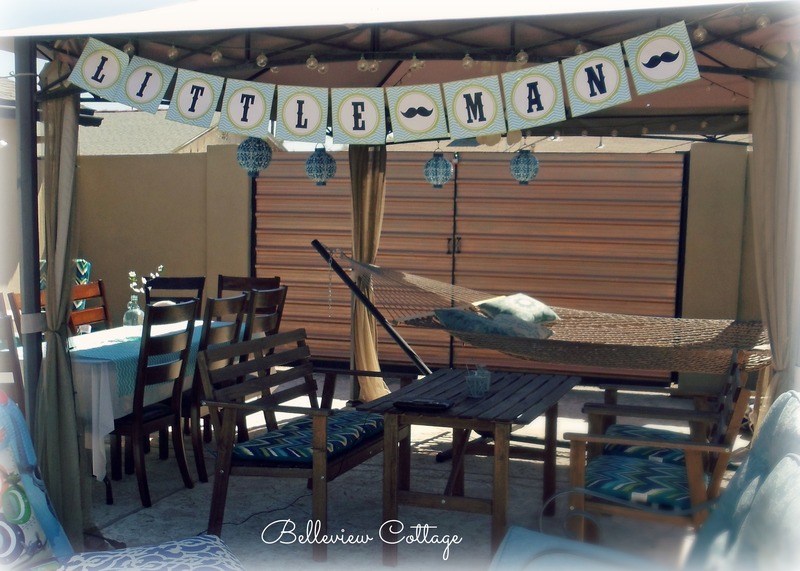 Also, check out my “Little Man” pinterest board, which features all of the ideas I got from tons of awesome pinterest pinners! 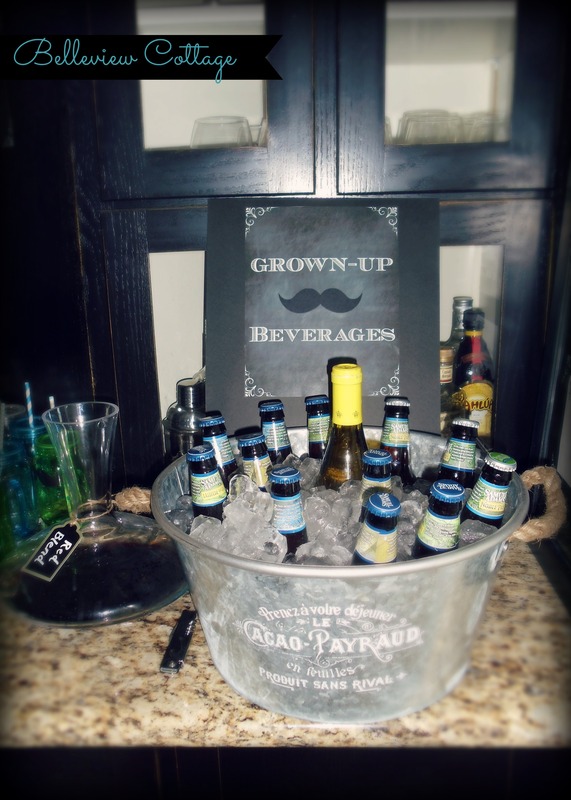 I also made a number of printable signs on display throughout the party. 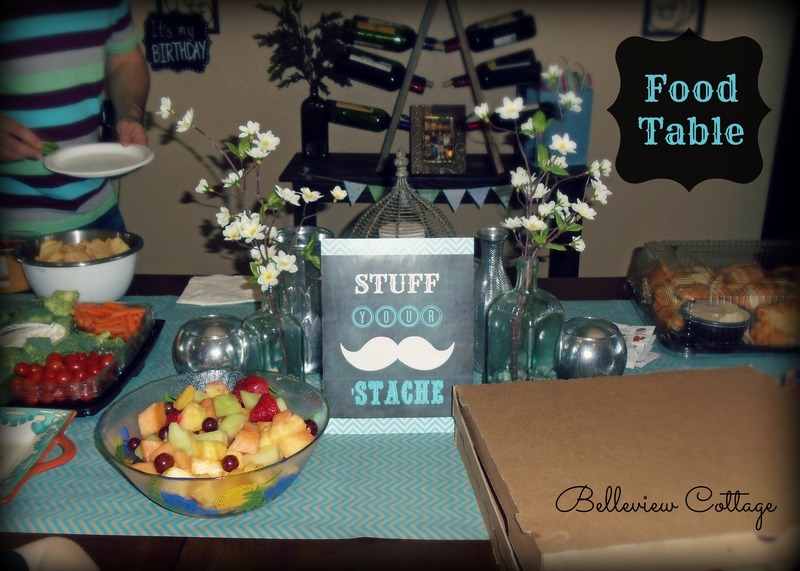 I used a chalkboard and blue chevron theme (and of course, lots of mustaches!). 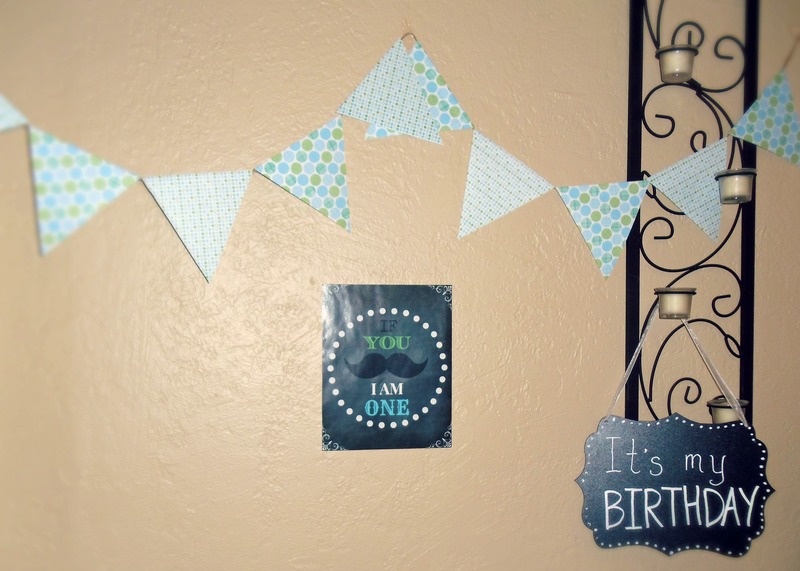 All of the printables you see at the party are available in my etsy shop. 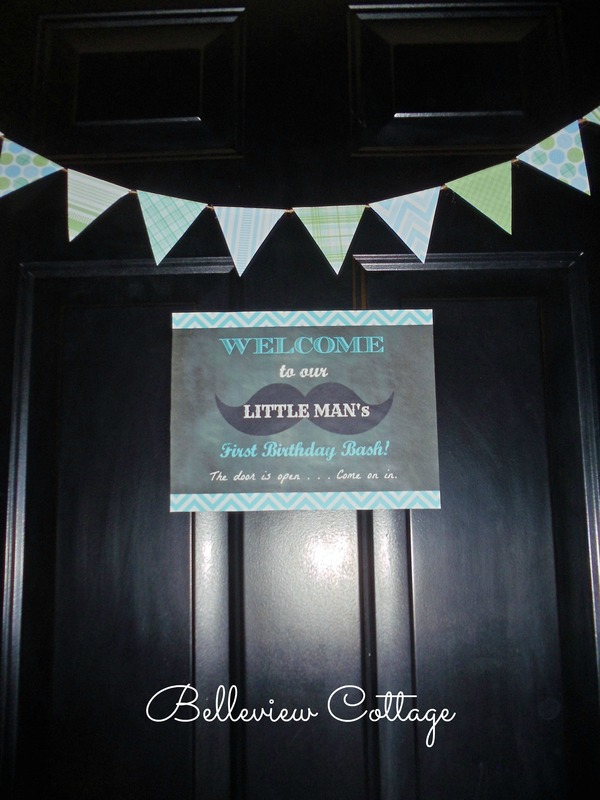 Here is a direct link to the Welcome Sign printable. 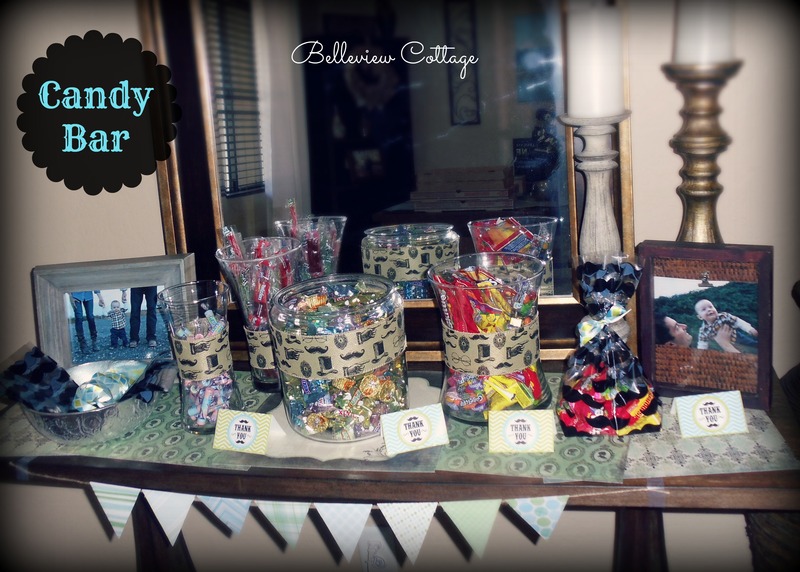 Inside the front door, I set up our party favors: a candy bar with cute mustache treat bags. The burlap banner is from Hobby Lobby. 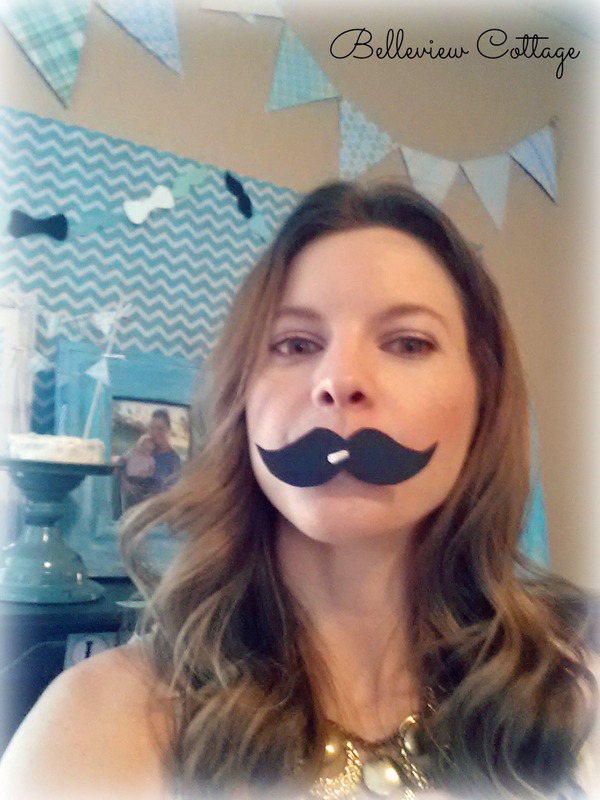 I cut out the bowties and mustaches from black cardstock and used double-stick tape to add them to the banner. That way I can re-use the burlap banner later. 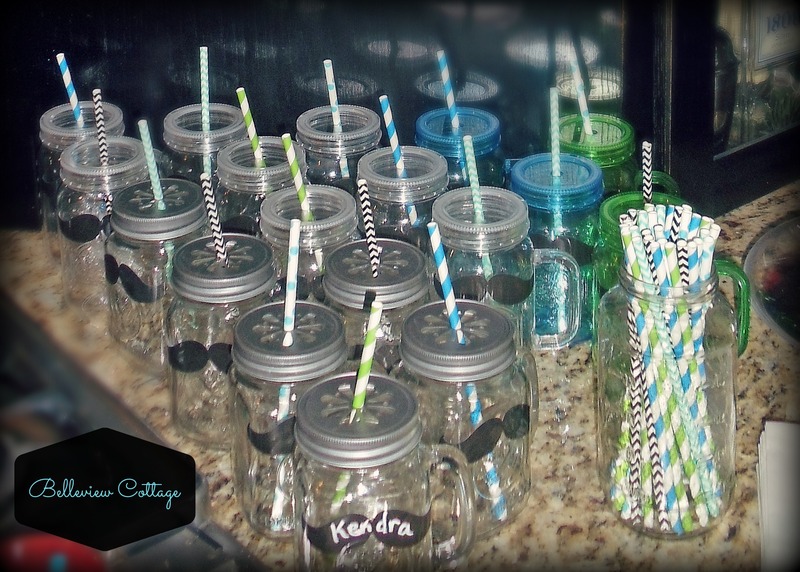 For the candy jars, I used glass vases and one large glass jar that I had on hand. 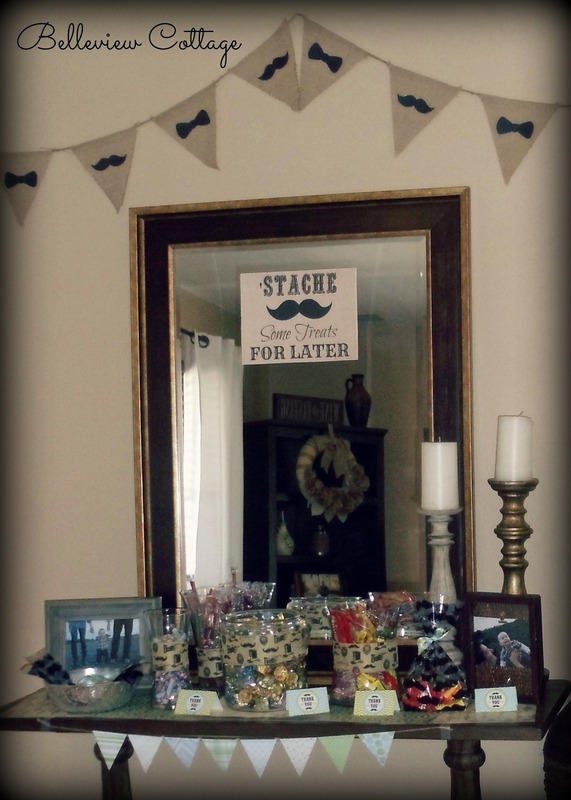 I added some adorable mustache & top hat ribbon from Hobby Lobby. Party guests were also greeted by this picture banner after entering the house. You can get the chalkboard clips here. I used a roll of wrapping paper as the table runner on our food table. I found this awesome blue & natural color wrapping paper for $1 at the Dollar Tree! This “Stuff Your Stache” printable is available here. 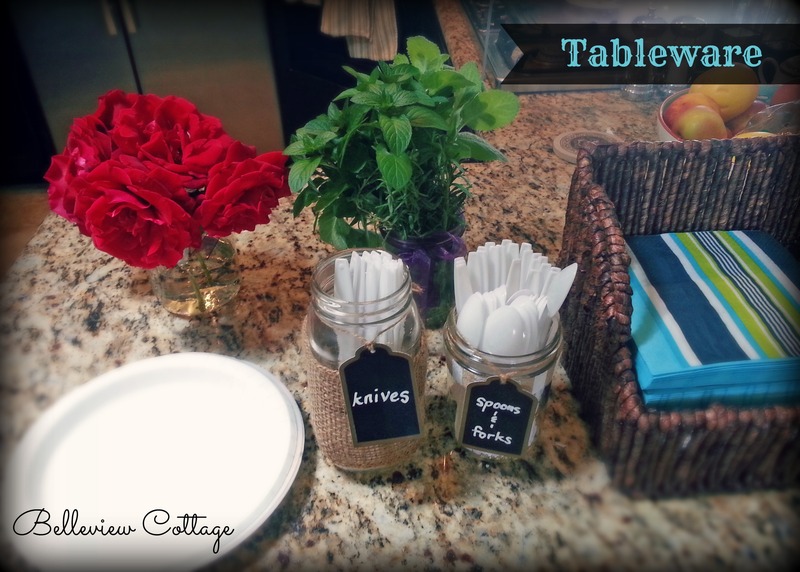 I used mason jars wrapped in burlap as containers for the plastic silverware. How fun are these chalkboard tags from The One Spot at Target? And I found the cute napkins for $1 at Big Lots! One of our party guests brought these mason jars with roses and fresh herbs. How awesome is that?! As an aside, how cute is our little man’s outfit from Carter’s?!?! 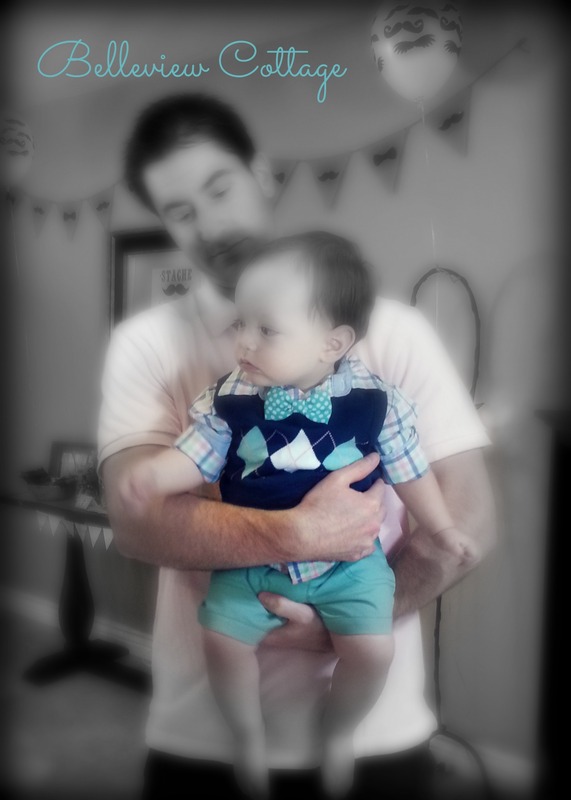 I ordered the bowtie from Flower Bucket Boutique, and I was so pleased that it matched the outfit perfectly! The paper straws were from a flash sale on JANE.com. Guests wrote their names on mustache stickers with a chalk marker. 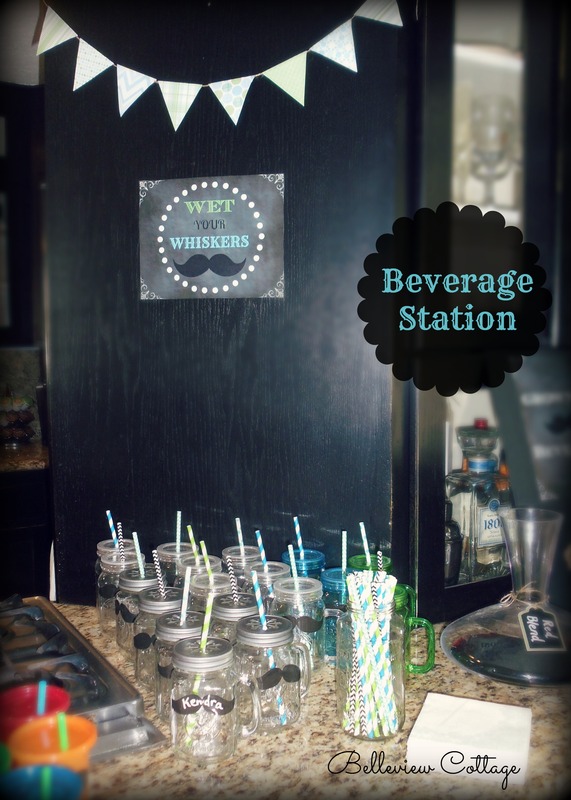 A great way for guests to keep track of their drinks! The chalkboard tags on the drinks are from The One Spot at Target. The awesome carafes holding the lemonade are from Ikea (only $3.99!). Here’s an awesome trick for parties: make large ice cubes using a cupcake or muffin tin. The larger ice cubes melt into the drink more slowly. For this party, I added fresh lemon, lime, strawberry, and cucumber slices to the water in the trays, and then froze them. 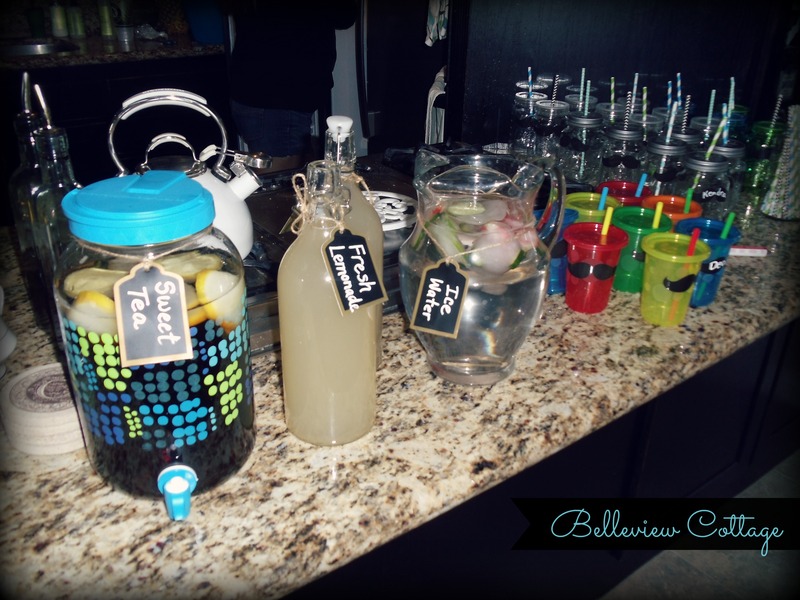 This created some awesome fruit-infused water, and the lemon ice cubes went in the sweet tea. I love this beverage tin that I found at Tuesday Morning! The treat table included cupcakes (red velvet, s’mores, carrot cake, and banana); mustache sugar cookies; mustache suckers; and chocolate-dipped pretzel “cigars,” shown below. You can get this “Real Men Eat Cupcakes” printable here. 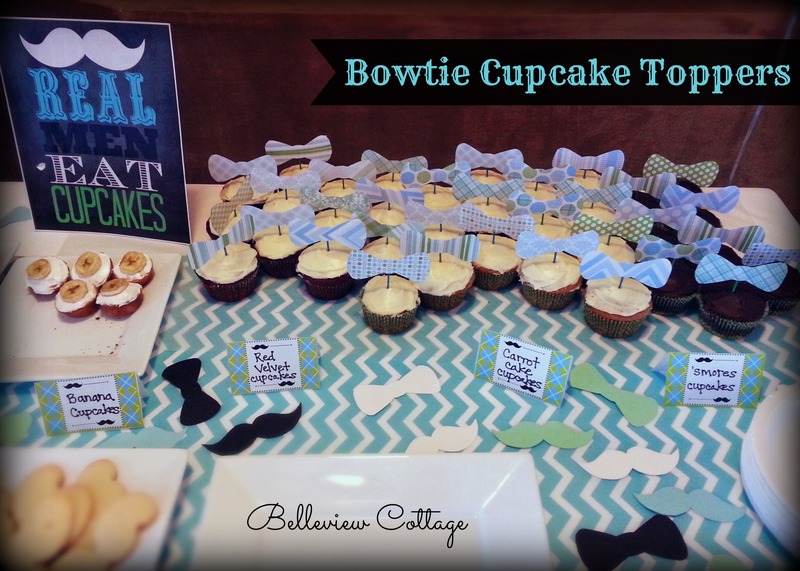 I made the bowtie cupcake toppers from scrapbook paper and toothpicks. 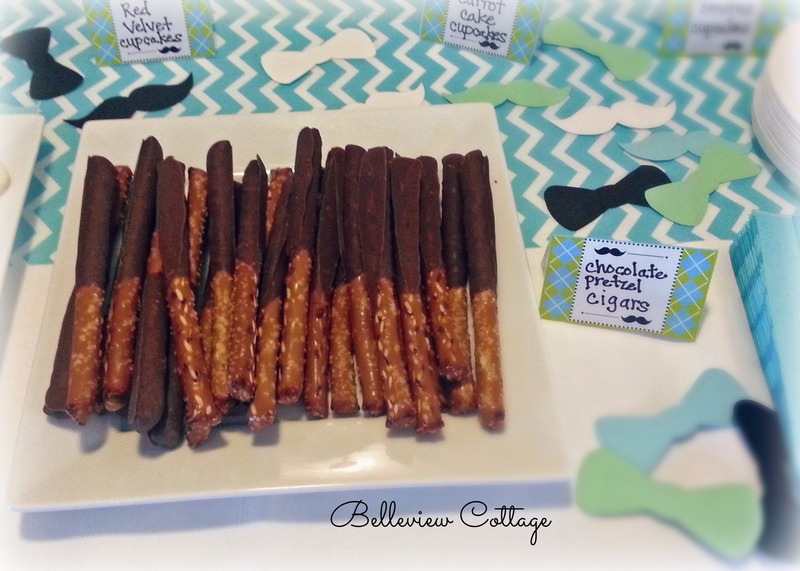 The chocolate pretzel cigars were a bit of a pain to make… it turns out that melting chocolate for dipping isn’t as easy as it would seem! And here’s the mustache sucker in action. I look pretty silly. The kids looked a lot cuter, but I don’t want to put pictures of other people’s kids up on my blog. The fabric that I found to make this backdrop was amazing! I got 2 yards on sale at JoAnn Fabric for around $5. I wish I could remember what it was called 😦 It was near the utility fabrics, and I want to say it is something like “bag fabric?” for making reusable tote bags and shopping bags. The consistency was almost papery. I secured it around a piece of plywood left over from a prior DIY project. 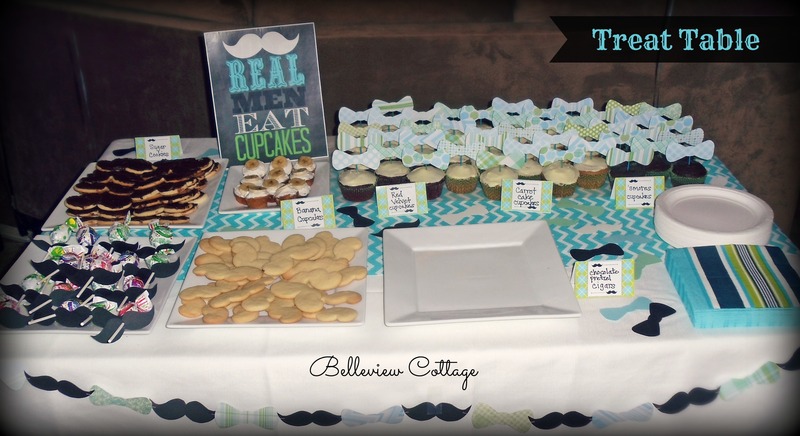 I also used the fabric as a table runner on the treat table. No sewing required; I just cut the fabric to the right size, and it was ready to go. I made the mustache and bowtie garland from cardstock and used a needle and thread to hold it together. I am pretty pleased with the way this smash cake turned out! The cake stand is a candle holder that I found at Hobby Lobby for 40% off. 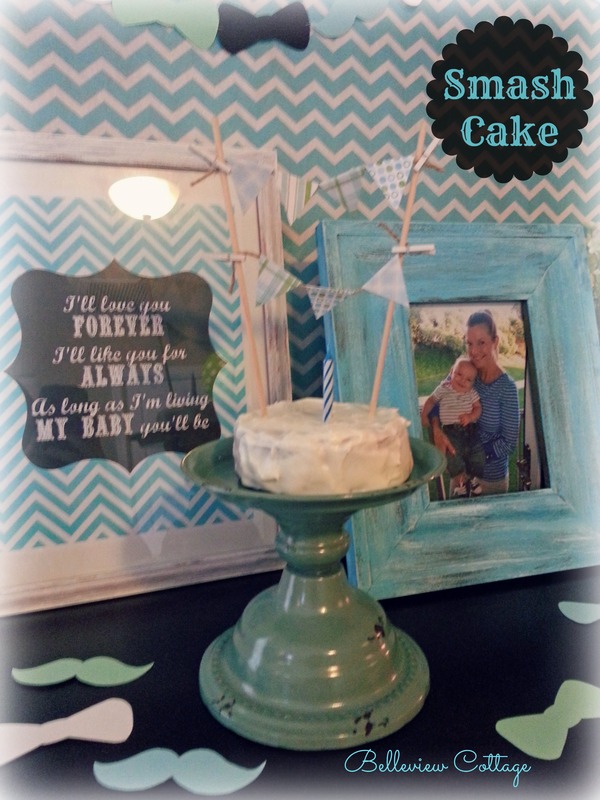 And I used this tutorial to make the bunting cake topper. 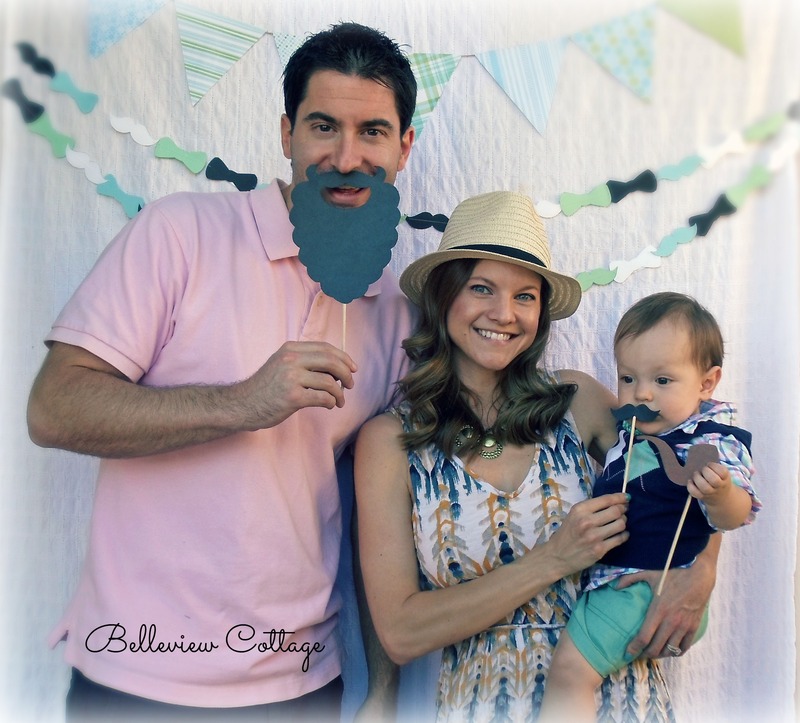 Do you recognize the blue chevron printable, above? You can get it for free on my blog, here! The cute little chalk board is from Hobby Lobby. 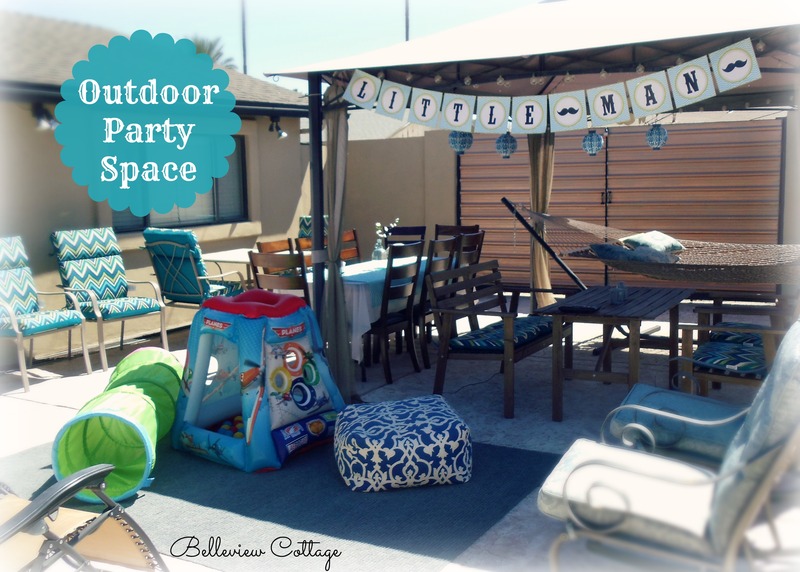 And now, the outdoor party space! Although the food & drinks were inside, the guests spent most of their time hanging out in the backyard, because the weather was beautiful! 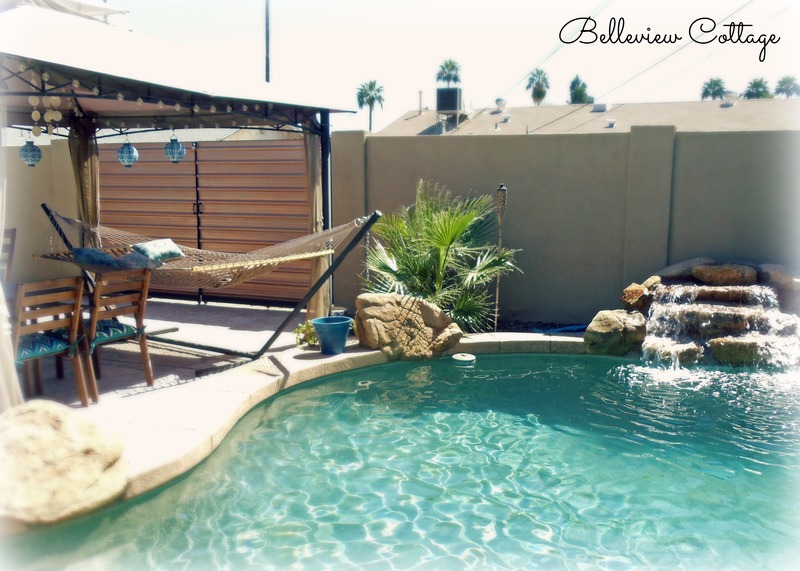 It was a perfect day for relaxing and playing by the pool. 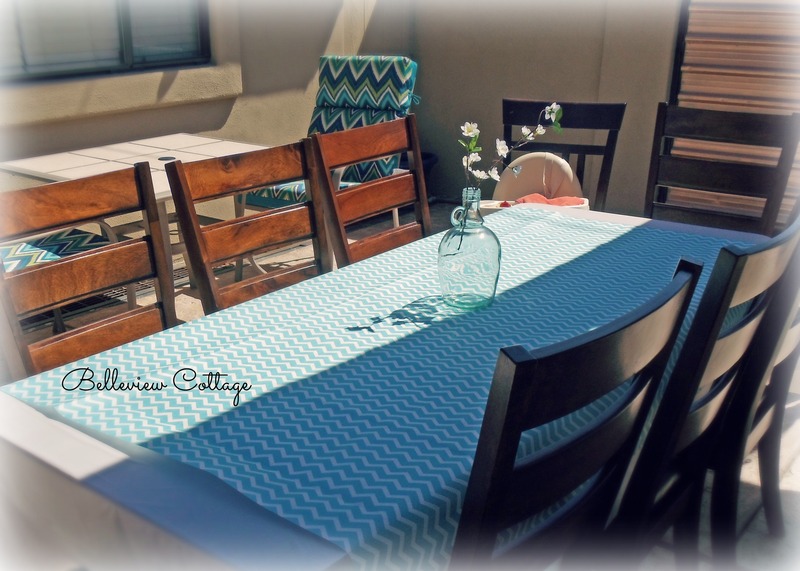 Here’s the same turquoise chevron fabric that I used inside the house. Again, it made a great table runner! 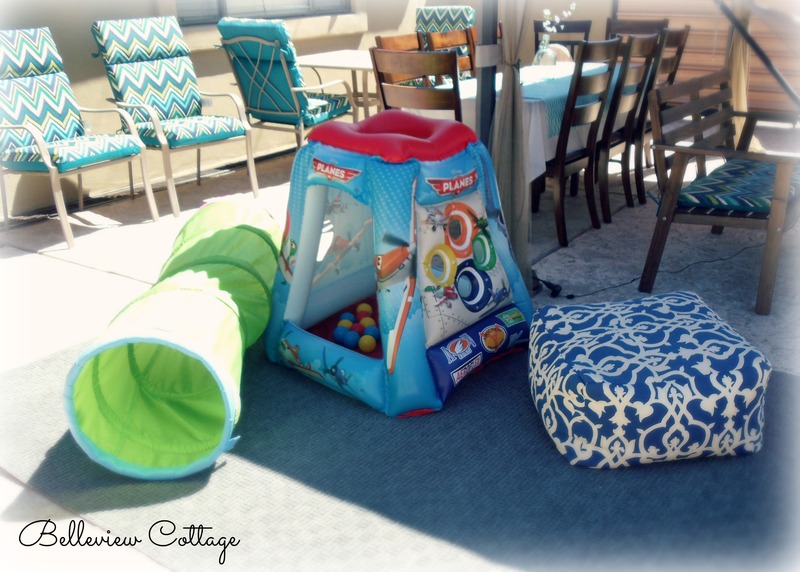 This play area was a big hit with the kids! They looooved the ball pit, and the play tunnel, too. How cute is this banner? It is a free printable by Printabelle, available here. 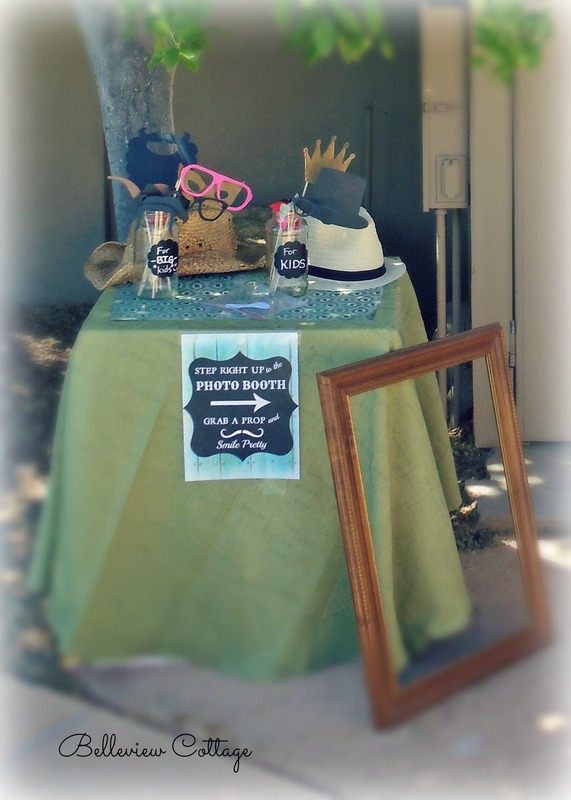 And finally, the big hit of the party was the photo booth! 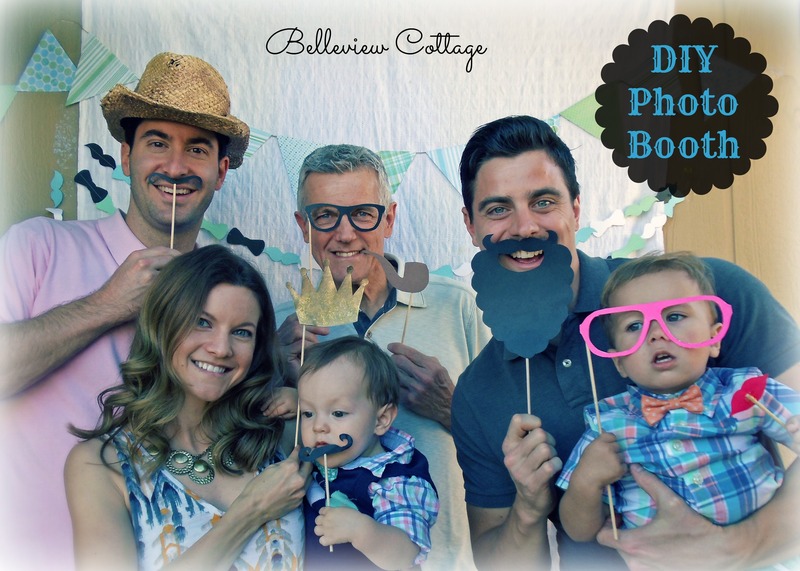 We all had a blast sporting the fun props and making silly poses 🙂 And now we have pictures of all our party guests for the little man to look at in the future. 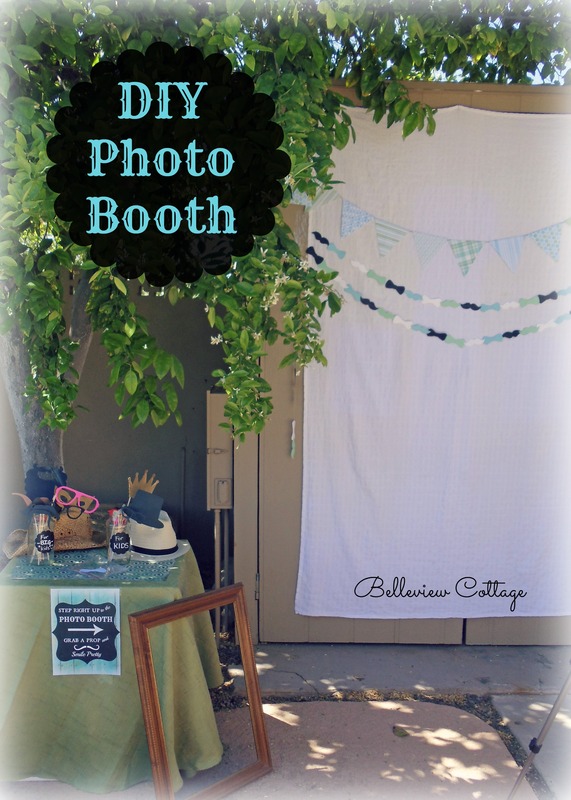 I made the photo booth props by hand using internet pictures as stencils. I used spray adhesive to attach the cut-outs to cardboard. Wooden dowels from Hobby Lobby made perfect wooden props. You can get the photo booth sign here. Next Post Easy No-Sew Fabric Bunting Tutorial! Hi there. I was on your Etsy site and going to buy these adorable signs, but they are no longer available. Will they be again soon? 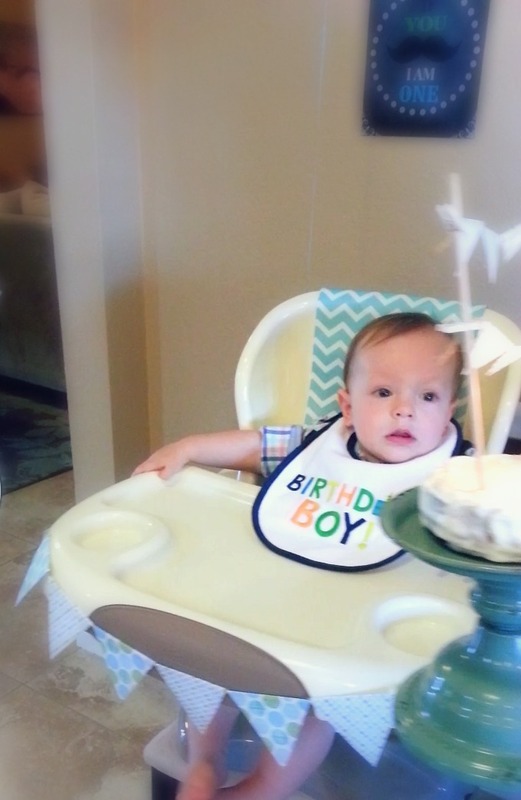 My son’s birthday is the 12th of August.